Content Area Literacy by Mark Conley, one of today's top literacy researchers, brings educators a wealth of hands-on, ready-to-use ideas, strategies and techniques for helping today's diverse secondary school students develop the literacy skills they need to be successful in all content areas. 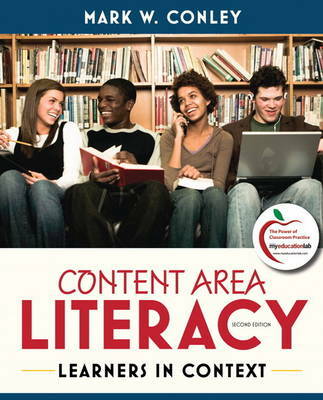 The first section of the book helps teachers confront the need to fully understand today's educational landscape, while the second section focuses on the specifics of how to go about planning and teaching, using principles of content area literacy. A unique final chapter pulls it all together by showing educators how to enlist students' cooperation while reaching out to parents and the community to support teaching and learning. "This textbook... provides good context to help readers of the book consider technology, popular culture, and English Language Learners. Its voice in the opening chapters is honest, sincere, and clear." "This text presents a strong integration of theory, research and practice. It is the best on the market. My students will appreciate the writing style, abundant strategies, and current research. Teachers will appreciate the extra guidance in making accommodations for English learners and special needs learners. It is a wonderful addition to all content teachers' libraries."